The Queen of Swords represents the Water in the Air, thus supplying the qualities of emotion and sensitivity to the airy element, the abilty to transfer and reflect, to form and create. As the mother of the Air, she will have a strong dominance of intellect. 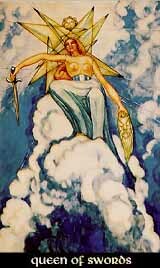 The Queen of Swords can be very sensitive, perceptive, sharp-witted and intelligent. On the dark side, she can turn cruel, malicious, narrow-minded, bigoted or even deceitful, dangerous, too, because of her charme and beauty. Being water in air, the Queen of Swords lacks the stability of the Earth as well as the will of Fire. So she can lack practicality, steadyness, running the risk to live in an idealistic land of her own outside of reality. Further, she is sensible to interferences and disturbance from the outside, unable to protect herself against it.